Many congratulations to the wonderful state of Maryland who have been rewarded with this fantastic news. MIAMI (June 5, 2008 ) — Carnival Cruise Lines, the world’s largest cruise operator, will launch the first year-round cruise program from the Port of Baltimore with seven-day cruises aboard the 2,124-passenger Carnival Pride beginning in fall 2009. The new program kicks off September 13, 2009, and encompasses two different weeklong itineraries departing Sundays from the historic Maryland port. Baltimore’s first year-round cruise program will feature a variety of interesting ports on two distinctly different seven-day itineraries. Exotic Eastern Caribbean departures will call at Grand Turk, Turks & Caicos; the private Bahamian island of Half Moon Cay; and Freeport, The Bahamas; while Bahamas/Florida departures visit Port Canaveral, Fla.; and Nassau and Freeport, The Bahamas. It is expected that the Carnival Pride will carry more than 115,000 guests annually from the Port of Baltimore. Including its new Baltimore-based program, Carnival Cruise Lines will operate from 17 North American departure points, including 11 year-round homeports – the most of any cruise operator. 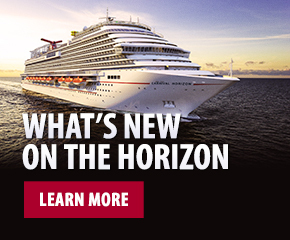 “We’re thrilled to introduce the first year-round cruise program from Baltimore aboard the Carnival Pride, a truly magnificent ‘Fun Ship’ that will visit a wide range of tropical destinations from one of America’s most historic cities,” said Gerry Cahill, Carnival’s president and CEO. “Today’s consumers are more value-conscious than ever and considering that Baltimore is within a day’s drive for millions of Northeastern U.S. residents, these new seven-day voyages provide a convenient and affordable vacation option,” he added. Carnival Pride’s year-round seven-day cruises from Baltimore will visit popular destinations in the Caribbean, Bahamas and Florida. Carnival Pride’s Exotic Eastern Caribbean cruises from Baltimore feature Grand Turk, a 10.5-square-mile island paradise which, in addition to a rich history, offers crystal-clear waters that attract snorkelers and divers the world over. Ships dock at the Grand Turk Cruise Center, a modern facility offering an 800-foot-long private beach, a Margaritaville-themed restaurant and a variety of retail shops. Also featured is Half Moon Cay, a crescent-shaped private island offering beautiful beaches and a diversity of watersports opportunities, along with a children’s aqua park and beachside cabanas. The third destination on this itinerary, Freeport, The Bahamas, is the island chain’s second largest city with excellent shopping at the International Bazaar and the Port Lucaya Marketplace, along with stunning beaches and exciting golf opportunities. Seven-day Bahamas/Florida cruises call at Port Canaveral, located on Florida’s Space Coast and in close proximity to Orlando-area theme parks and attractions, as well as the world famous Kennedy Space Center. Visitors also enjoy the area’s gorgeous white-sand beaches and crystal clear waters. Other ports include Nassau, the historic Bahamian capital known for its outstanding duty-free bargains, beautiful beaches and laid-back atmosphere. During their visit in Nassau, guests can tour a variety of historical sites, including centuries-old forts. A daylong visit to Freeport rounds out this itinerary. 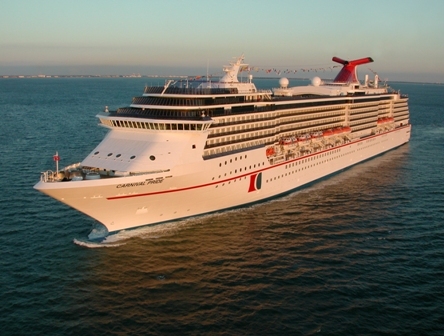 Prior to the start-up of year-round seven-day cruises, Carnival Pride will operate a special one-time six-day departure round-trip from Baltimore September 7-13, 2009. Featured ports on this voyage include Freeport and Port Canaveral. The 88,500-ton Carnival Pride offers a host of facilities and features, including indoor and outdoor promenades, a wedding chapel, and an elegant reservations-only supper club located at the top of a soaring nine-deck-high atrium and accessible by a glass staircase, just one of several different dining venues on board. Other features include a ship-long promenade with a variety of lounges, bars and nightspots, including a multi-level theater showcasing lavish production revues. Family friendly amenities include organized programs for three different age groups – “Camp Carnival” for younger kids, “Circle C” for 12- to 14-year-olds, and “Club O2” for older teens – with supervised activities and expansive facilities for each. Carnival Pride also offers a variety of accommodations including a wide selection of balcony staterooms and suites – perfect for scenic cruising. All Carnival Pride accommodations feature the Carnival Comfort Bed sleep system with plush mattresses, luxurious duvets and high quality linens and pillows. Carnival Pride also houses an Internet Café, along with ship-wide Wi-Fi access and cell phone service. Reservations are currently being accepted for the Carnival Pride’s new departures from Baltimore. Special rates for third and fourth guests sailing in the same stateroom, along with round-trip air supplements from a variety of North American gateways and pre- and post-cruise Baltimore land stays, are also available.